The 2A Trails Committee, along with Routt County, the city of Steamboat Springs, U.S. Forest Service and various user groups and business entities have an extraordinary opportunity to achieve the long-held visions of Routt County residents while enabling a valley-wide amenity for bicyclists, pedestrians and equestrians. In particular, work toward a corridor trail that connects Steamboat to the outlying communities of West and South Routt. Having led and managed bicycle tours in New England and Europe, this would be an amenity that benefits both residents — for commuting — and visitors alike. The bike trails in Switzerland are an exemplary model. I am a life-long resident of Routt County and have always enjoyed hiking, biking and horseback riding on our trails. Working in outdoor tourism for a couple decades also gave me a unique perspective for what visitors seek in their adventures. 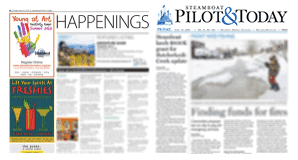 Living in West Routt, the goal of a connecting trail to Steamboat has been in discussions for several decades. Working toward a trail that enables users to access the valley — without being in a vehicle — is a goal that is worth achieving. I am concerned that current discussions do not align with the publicly documented “compass points” and would only serve a small minority of extreme mountain bike enthusiasts. Plans that incorporate public funding must benefit the greater good. It is also critical that we need to carefully plan for being “visitor ready” and absolutely ensure that our greatest assets are very carefully stewarded and protected. Any concern for wildlife habitat should be highly considered as well as the proposals should benefit the highest number of users. It is critical to take the time, now, before trails are constructed, habitat impacted and funds allocated, to ensure that plans align with the Vision 2030 desired outcomes and actions for respective areas of agriculture and open space, recreation and transportation. Read more online at http://report.routtcountyvision2030.org.